Creamy and rich in flavor, this easy vegan mushroom gravy is made with minimal ingredients and pairs perfectly with mashed potatoes, biscuits and lentil loaves. Recipe adapted from Chef John’s. Heat oil over medium heat, add mushrooms and season with a pinch of salt. Simmer mushrooms, stirring occasionally, until liquid is almost evaporated, about 15 minutes. Add flour, continue cooking and stirring for about 3 – 5 minutes, at least until the flour has been absorbed and not white anymore. Add 1 cup of broth, stirring/whisking briskly until incorporated and liquid has thickened, there should be no flour lumps, about 5 minutes. Slowly pour in the remaining broth and mix thoroughly. Season with black pepper and thyme. Simmer at a gentle boil over medium-low until thickened, about 20 minutes, stirring often. Gravy will thicken upon standing. Taste for flavor, adding more salt and pepper as needed. If you find the gravy isn’t thickening up, mix 1 tablespoon oil with 1 heaping tablespoon flour, mix well until completely blended, add to simmering broth, stirring until dissolved, continue cooking until thickened. 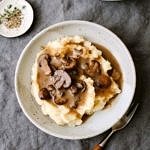 I used mushroom gravy when making this recipe which gave it a rich brown color, if using vegetable broth your gravy may be lighter in color. Make this gluten free by using gluten free flour.